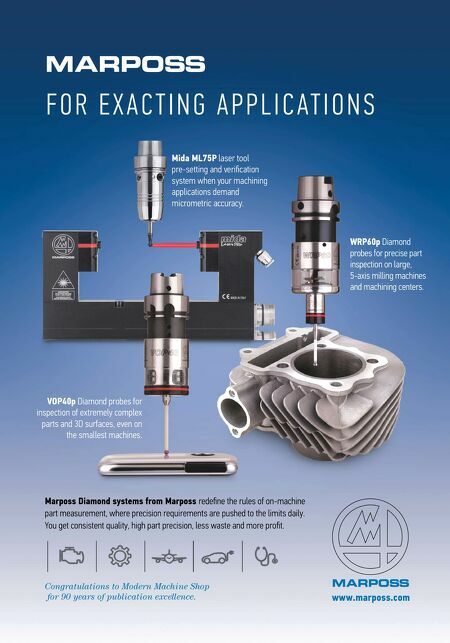 THE VIEW FROM MY SHOP MMS JUNE 2018 46 mmsonline.com A Metalworking Leader's Perspective ABOUT THE CONTRIBUTOR Founded in 1952 as a small machine shop, Marini Manufacturing has grown into a modern provider of precision-machined components and assemblies. Email tmarini@marinimfg. com or visit marinimfg.com. Shrinking Technology HAIMER Power Clamp Shrink Fit Machine Reliable tool changes – Fastest in the Galaxy. 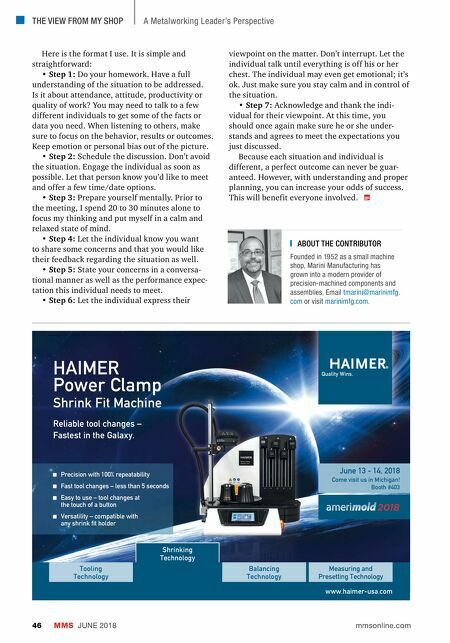 Measuring and Presetting Technology www.haimer-usa.com Balancing Technology June 13 - 14, 2018 Come visit us in Michigan! Booth #403 Tooling Technology Precision with 100% repeatability Fast tool changes – less than 5 seconds Easy to use – tool changes at the touch of a button Versatility – compatible with any shrink fit holder Here is the format I use. It is simple and straightforward: • Step 1: Do your homework. Have a full understanding of the situation to be addressed. Is it about attendance, attitude, productivity or quality of work? You may need to talk to a few different individuals to get some of the facts or data you need. When listening to others, make sure to focus on the behavior, results or outcomes. Keep emotion or personal bias out of the picture. • Step 2: Schedule the discussion. Don't avoid the situation. Engage the individual as soon as possible. Let that person know you'd like to meet and offer a few time/date options. • Step 3: Prepare yourself mentally. Prior to the meeting, I spend 20 to 30 minutes alone to focus my thinking and put myself in a calm and relaxed state of mind. • Step 4: Let the individual know you want to share some concerns and that you would like their feedback regarding the situation as well. • Step 5: State your concerns in a conversa- tional manner as well as the performance expec- tation this individual needs to meet. • Step 6: Let the individual express their viewpoint on the matter. Don't interrupt. Let the individual talk until everything is off his or her chest. The individual may even get emotional; it's ok. Just make sure you stay calm and in control of the situation. • Step 7: Acknowledge and thank the indi- vidual for their viewpoint. At this time, you should once again make sure he or she under- stands and agrees to meet the expectations you just discussed. Because each situation and individual is different, a perfect outcome can never be guar- anteed. However, with understanding and proper planning, you can increase your odds of success. This will benefit everyone involved.